Yesterday I went to a cosplay event with my friends. I just want to dress up something so,I used the yukata I bought last year. Actually...yeah,I don't kidda want to call it cosplay tho but I add some thing to my yukata also. I makeup from home coz it'd take a long time to do it at the event. This was my makeup and hair in the first place. 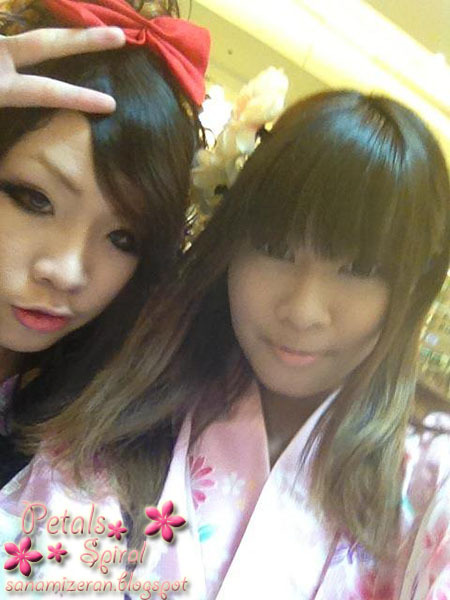 I met up with my friend,Karen.We're both dressing in yukata yesterday. This pic is from Karen's phone. The event took place at Siam Paragon,it's so crowded!! We were forcing our ways to the stage to see cosplayers' performance. It was Pretty Cure on the stage. Can you guess what's this show? It's Gintama! !I really like this show tho. Cover dance.My high school friend,Aigo,was on the stage. Nana was cosplaying Sheryl Nome. I think I was forcing the smile somehow. The weather was really hot,I felt like melting! !